You may remember that each year GlutenFreeTravelSite anoints one particular location with the title of "World's Most Celiac-Friendly Destination." It's based on the number of reviews GlutenFreeTravelSite receives for each geographic area over the previous year. This year, we're happy to announce that the state of Pennsylvania received top honors. This is due in large part to the many, many Philadelphia-area restaurants that have undergone training through the GREAT Kitchens program run by the National Foundation for Celiac Awareness. The GREAT Kitchens program was created to rigorously train restaurants and their staff in the safe preparation of gluten free meals. The NFCA program provides a "Train the Trainer" course for chefs and food service managers, which gives them the knowledge and tools to educate their entire kitchen staff on safe gluten-free food handling. You will find many GREAT Kitchens trained restaurants within the Pennsylvania section of our site. To search more specifically by zip code, town, or city (i.e. Philadelphia) for GREAT Kitchens restaurants and other reviews, simply enter a town or zip at the top of our Search Reviews page. You'll find reviews from many other areas of Pennsylvania as well. And if you're interested in reading about the past winners of our annual contest...New York, Florida, the Washington DC Metro area, and California, visit the Annual Contest page of GlutenFreeTravelSite. 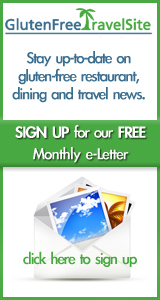 What have YOU found to be the most Celiac-friendly area to live or travel? Any particular state or country you'd recommend? How about a favorite GF-friendly resort? We'd love to hear your comments below!